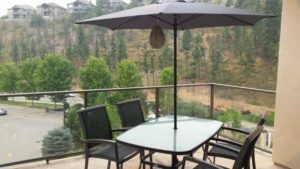 Pinnacle Pointe is located at 1873 Country Club Drive in Kelowna, and it is sure to please anyone looking for high-end affordable accommodations. The luxury resort is located right by two championship golf courses known as the Bear, and the Quail. There are more golf courses within minutes of the resort.There is a nice restaurant at the golf course, a coffee shop and pizza outlet all within a 5 minutes walk. Pinnacle Pointe is also conveniently located to the University of British Columbia Okanagan (UBCO) (10 minute drive) and to downtown Kelowna (short 20 minutes drive). Within a 5 minute drive are restaurants, a Starbucks, Tim Horton’s, Liquor store and Nesters grocery store. The resort itself features an outdoor pool and hot tub as well as a fitness center and they are all located close to the suite for your convenience. If you are looking for a truly exceptional suite in a great country golf course setting where nature comes right to your door, then you have found it here at the Pinnacle Pointe Resort! This 1300 sq.ft. 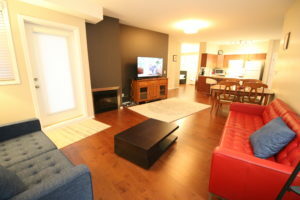 2nd Floor, 3 Bedroom, 2 Full bathroom suite is decorated, furnished and accessorized to the highest standards. The Master Suite provides a King bed for ultimate comfort, a large 5 piece Ensuite bathroom and a desk for studying or checking in at the office. There is also a 40″ LCD TV in the Master bedroom. The second bedroom features a Queen bed with a desk, while the third bedroom has a double captain’s bed. This is a ground floor corner suite with a peekaboo view of the golf course and a lovely patio. This suite can accommodate a maximum of 6 guests. The large, roomy living room/dining room are has several windows providing natural light and a bright and cheery atmosphere. There is high- end leather furniture and a 50″ LCD TV in the living room, with the dining room providing seating for 6. The suite provides high-speed wireless internet and basic cable service throughout. The suite also features a gourmet kitchen with eating bar and comes fully stocked with all the items you will need to feel totally at home. There is a washer and dryer in suite and we provide most amenities such as paper products, soaps, laundry soap, garbage bags, coffee, tea and some assorted spices. We have stocked the entire suite with everything you could possibly need in order to provide you with optimum convenience so you can just start relaxing from the moment you arrive. Book early to avoid disappointment. Full cable service along with high speed internet, extra towels, linens, washer, dryer, laundry supplies, gas barbeque on the deck.